A steaming bowl of potato soup definitely qualifies as comfort food, particularly on a cold winter day. Depending on its ingredients, it can be a healthy addition to your diet or it can add unwanted fat and calories. By learning to recognize the difference between healthy and unhealthy ingredients in potato soup, you can be sure yours is worth eating. You can eat commercial soups as is, or add additional potatoes and other ingredients. Unfortunately, many canned soups contain preservatives and excessive sodium. Health food sections of many supermarkets stock boxed soups that contain organic ingredients and no preservatives. However, they may still be high in sodium. You control the ingredients in homemade soup. The basic ingredients of potato soup are potatoes, milk, butter, herbs and spices. Beef or poultry stock is sometimes used. To make a healthy soup, use low-fat or soy milk. Reduce or eliminate butter; use bouillon cubes instead of stock. Experiment with herbs and spices to achieve a flavor you like without the use of sodium. The University of Illinois Extension says a white potato measuring 2 inches by 4 3/4 inches contains approximately 145 calories, 33.6 grams of carbohydrates and 3.5 grams of protein. The protein is incomplete, meaning it does not contain all essential amino acids. Potatoes are a good source of vitamin C, magnesium, potassium, phosphorus and niacin. Nutrient amounts vary depending on the type of potato. One cup of milk -- the other main ingredient of potato soup -- supplies approximately 8 grams of complete protein and 12 grams of carbohydrates. Milk is a good source of B-12 and riboflavin. It also supplies approximately 300 milligrams of calcium, which is a third of an adult’s daily requirement; most is fortified with vitamin D to help calcium absorption. Except for fat and calories, nutrient values vary only slightly with differences in fat content. Soy milk can replace some or all of cow’s milk when making potato soup. One cup contains approximately 7 grams of complete protein and 4 grams of carbohydrates. The fat content of 4.5 grams is slightly more than the 3 grams in low-fat milk. Fortified versions of soy milk usually contain vitamins E, B-12, D and calcium. 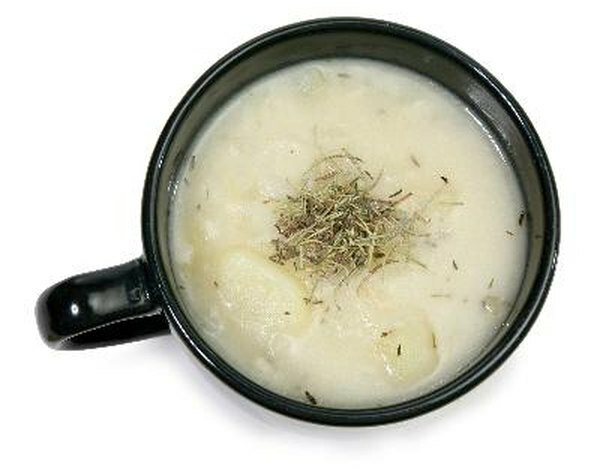 Increase the nutrition, flavor and appearance of potato soup with additional ingredients. Spinach provides vitamins A, C, E, K and several B-vitamins, along with calcium, manganese, magnesium and potassium. Boil spinach for one minute, then chop and add just before serving to avoid a greenish cast to the soup. Cook shredded carrots with the soup to provide vitamins A, C, K and B-vitamins, as well as several minerals. Antioxidants in vegetables are responsible for their color, so add any brightly colored vegetables that appeal to you for an antioxidant boost, flavor and eye appeal. Finally, instead of topping a bowl of potato soup with bacon bits, top it with crumbled cooked soy bacon. The flavor is nearly identical to bacon, but without the saturated fat.